In a world where you need to beat monsters with a paintbrush, you can switch with another character. Dodging not only evades enemy attacks, as it helps switch characters in order to perform different attack specialties on enemies. 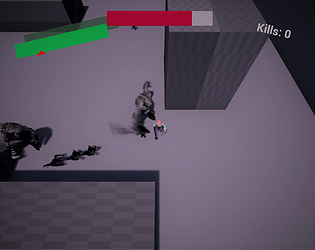 Different attacks affect different enemy types. Additionally, stamina is used up with dodging and attacks. Enemies were used from Epic Games' fair-use free "Infinity Blade" assets.